Mario and Yoshi encounter a Hyper Paragoomba and Hyper Spiky Goomba. Twilight Trail is a large woodsy trail that connects Twilight Town to Creepy Steeple. 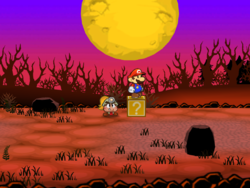 It is found during the events of Paper Mario: The Thousand-Year Door. Twilight Trail is a dark area full of bare trees and dark green grass; the ground on which Mario must travel is purple in color. 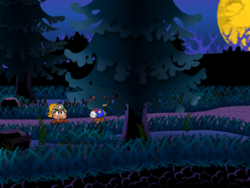 During Chapter 4 of the game, Mario must travel back and forth throughout these woods many times in order to find The letter "p" and defeat Doopliss. In order to gain access to Twilight Trail, Mario must enter a pipe — which Flurrie must unveil — and head towards the dark forest. Flurrie must also blow away certain parts of the woods to enable Mario to continue forth. In these woods, many enemies can be found; it is also hard to avoid contact with these enemies, as the paths in which they travel are considerably narrow. Towards the end of the forest, a large rock must be pushed in the background by Mario in order for its larger version in the path to move. Twilight Trail is also the home for the dangerous Amazee Dayzees. The in-game map description reads, "A forest trapped in a perpetual state of dim twilight. One must watch one's step while navigating the paths." In a yellow ? 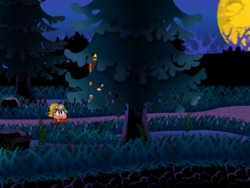 Block in the woods' first screen, a Thunder Rage can be retrieved. In the second screen, a red ? Block holds the Hammer Throw badge. For enemy formations in Twilight Trail, see here. Black Key In the first screen to the right of Twilight Town, it's in the wooden house near the entrance. Earth Quake In the first forest screen, it's in the question block in the northeast. Hammer Throw In the second forest screen, it's in the red block on the path. Shine Sprite In the third forest screen, it's behind the last tree before Creepy Steeple. Shop Key In the third screen to the right of Twilight Town, it's to the right of the fallen tree. Mario gets it with Koops in Chapter 4. Star Piece In the third screen to the right of Twilight Town, it's behind the fallen tree. In the third screen to the right of Twilight Town, it's behind the pipe that leads to the forest. Super Shroom In the second screen to the right of Twilight Town, it's in an invisible block above the question block on the north side. Super Shroom In the second area from Twilight Town, Mario should find a ? Block, then jump up from it to reveal the hidden ? Block. Coin Block In the dark wooded area with the boulder that must be pushed, Mario should jump left of the first hole to reveal the hidden ? Block (covered by a tree in the foreground). This is Twilight Trail. Kind of a depressing little road, don’tcha think? I feel like something bad’s GOTTA be at the end of it. …Maybe I’m just superstitious. This is more of Twilight Trail. A lot of enemies around here, seems like. 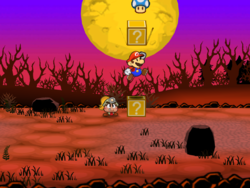 Hey, by the way, Mario…is it me, or has the moon been getting bigger? Not… Not that I’m scared or anything! Re…Really! This is Twilight Trail. Looks like some seriously spooky woods over there. I hear some of the villagers go there to collect herbs. That’s totally insane… I’d NEVER go someplace like that on my own, not even for a million coins! This page was last edited on December 17, 2018, at 10:48.